Part of the perks as a food photographer is that I get to taste some of the most delicious and beautiful dishes. This photography project I did with Dietician Heather K Jones is the perfect example. Heather is a long-time client of mine, and she reached out to me again when she was guest blogging on renowned healthy food blog Skinnytaste. With all the colors and textures from this dish, I decided to style the photoshoot with a cleaner look. The ingredients and dish were presented on a simple white surface with blurred details in the background to add texture to the photographs. As a food photographer, I generally like to shoot in natural light, and this time was no exception. The afternoon light through the large window lit the food evenly. 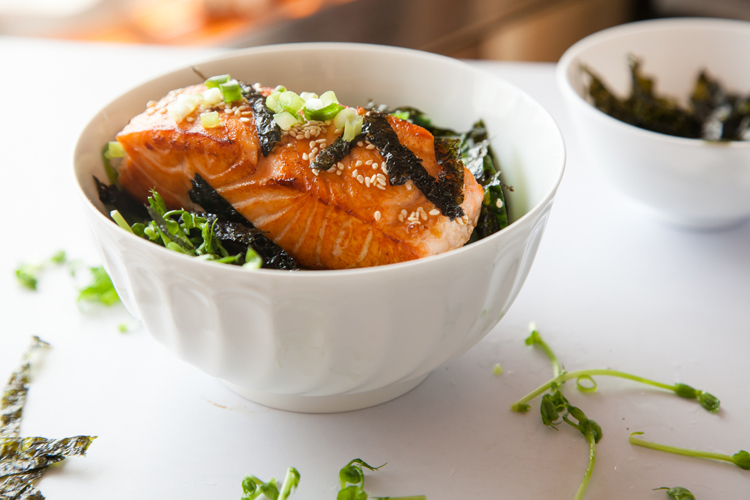 The recipe called for brown rice as base, topped with avocado, English cucumber, sprouts, nori (dried seaweed), green onions, toasted sesame seeds… and of course, salmon! The combination turned out to be a healthy and hearty lunch. Check out the blog post on Skinnytaste for the complete recipe. I’m getting hungry just writing about this!